Industrialization brought with it new concepts of leisure time and day-trips to the country. Due to the railroads, little villages by the Seine were now just a train ride away. The artists of the time, of course, took this opportunity to broaden their scope and picture this aspect of modernity as well. Monet, Renoir and Pissaro were painting in the area of Argenteuil, a little town northwest of Paris that could be reached very easily by train. Manet also went out to Argenteuil in the 1870's and did some paintings that, today, we read as a social commentary of the effects of industrialization on Parisian society. The influence of the Impressionists can be seen in the lightening of Manet's palette from black and grays to blues and whites. One fundamental difference between Manet and the other Impressionists was that he was still painting his works indoors and the models we see in the pictures would actually pose for him in his studio causing his figures to be frozen in time. When we look at this painting of a couple sitting in front of boats by the water, at first sight it looks like a typical middle class courting couple, out for a day of leisure on the beautiful, blue waters of the Seine. Upon closer inspection, we can pick out a lot of clues to counter this first assumption. First of all, there is a sense of disconnect between the couple. While the man has his arm behind the woman and is turned towards her in a gesture of trying to creep into her space, she seems to be distant in her own world, staring out towards us. Manet has the man holding her parasol while she is holding a bouquet he might have given her but even that does not dispel the detachment of the figures to one another. He seems to be visually enforcing the disconnect between the couple by their body language as well as the stripes of their clothing. 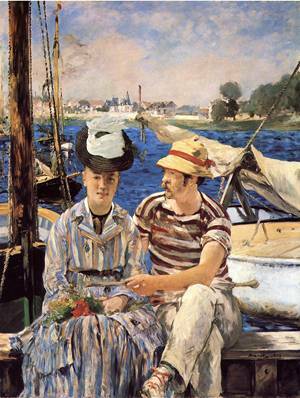 The emergence of the lower middle class seems to be one of the main circumstances of modernist art.1 In Argenteuil Manet is visualizing this phenomenon. 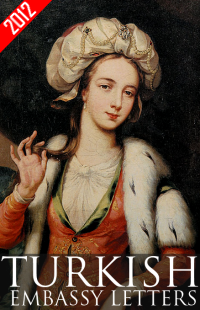 Fashion can be a very revealing sign about someone's social status; we can tell the woman in this painting is probably from the lower middle class since the colors and stripes of her dress, as well as her buttons, would have been considered garish and not refined at all. The man's class is not as obvious as the woman's since he is in a boating outfit but he was most likely middle class as well. There was also a lot of commentary about the petite bourgeois going out to the environs of Paris for a Sunday to enjoy the country while 'the country' was being polluted by industrialization. Manet was fascinated by industry as well as the relationship between men and women. The signs of industrialization are very apparent in his landscape paintings. There is evidence of factories in the background where a smoke stack can be seen next to a church. Also the deep blue of the water is suppose to be due to the refuse of india ink from the factories. He shows us the juxtaposition between the signs of industry and the leisure activities of the middle class. Manet's flat surfaces reappear in Argenteuil as well. The light and dark tones he uses without any middle values can be easily seen in the man's arm and pants. He seems to have left some areas ambiguous, merging them without giving any specific detail as in the rope hanging in the side of the boat. Here, Manet gives us a small portion of life, a slice of his vision. He has captured the changes taking place and the results of those changes. He has given us a sense of what Argenteuil was like in the 1874 with what all its incongruity, in boating near side of industry, the current fashions of the lower-middle classes and the mobility and search for leisure of the petite bourgeois.